Paige MacNamara plays Janis Joplin in the production about the legendary singer’s life opening at Ivoryton Playhouse, May 30. Photos by Curtis Brown. The Ivoryton Playhouse will present the 2014 Tony Award-nominated 2013 Broadway Musical A Night With Janis Joplin, written and directed by Randy Johnson, from May 30 to June 24. 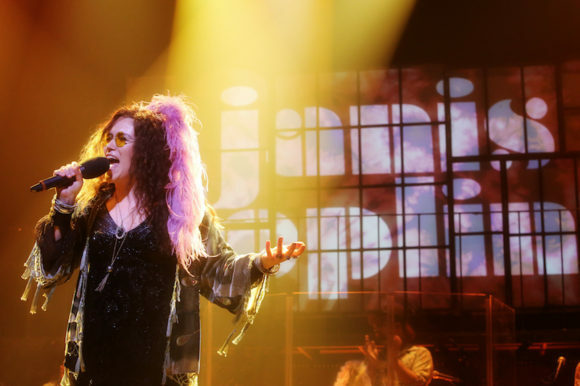 A Night with Janis Joplin made its Broadway debut, under the direction of Randy Johnson, on Oct. 10, 2013 at the Lyceum Theatre, where it played for 140 performances before closing on Feb. 9, 2014. Mary Bridget Davies, who made her Broadway debut in the title role, earned a 2014 Tony Award nomination for Best Performance by an Actress in a Leading Role in a Musical, and won a 2014 Theatre World Award for her critically acclaimed performance. Sharing the lead role of Janis Joplin in this production are Francesca Ferrari* and Paige McNamara*. 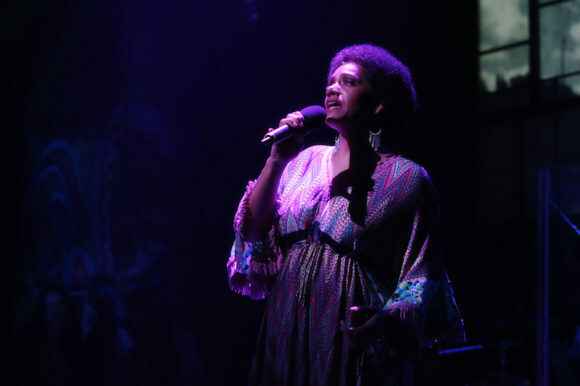 The cast also includes Aurianna Angelique*, Jennifer Leigh Warren*, Tawny Dolley*, and Amma Osei* who take on the roles of the many women who influenced Janis – Aretha Franklin, Etta James, Bessie Smith, Nina Simone and many more. A Night with Janis Joplin opens at the Ivoryton Playhouse on May 30 and runs through June 24. Original direction by Randy Johnson, original set design by Brian Prather, original lighting design by Ryan O’Gara, original projections by Darrel Maloney, original costume designs by Amy Clark and original wig designs by Leah Loukas. This production is co-directed by Tyler Rhodes. Musical Director is Michael Morris.